After tense negotiation, Germany had agreed to deliver its fleet — into the hands of the Allies. The delivery was to be made 10 days after the Armistice of Compiegne. Operation ZZ , as it was designated, was executed on 21 November 1918. Two days earlier nine German battleships, five battlecruisers, seven cruisers and 50 destroyers had set sail, heading west. Under the terms of the Armistice which had ended the war they were to hand themselves over in the Firth of Forth, before being brought to the lonely Orkney anchorage of Scapa Flow. This letter is dated 22 November 1918 and written from the battleship HMS Hercules. 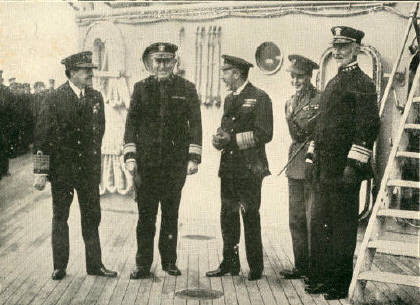 It describes the surrender of the German High Seas Fleet at the very end of the First World War, 1914–1918. When I went on deck, the German fleet was steaming down between our two fleets, in an opposite direction, led by one of our light cruisers, the Cardiff. Each British fleet was about 3 miles distant from the Germans. After we had passed them, the two British fleets did a magnificent 16 points turning movement and steamed down the German line, closing in on them at the same time, and so they were escorted into the Forth. . . The scene is impossible of description. This grand turning movement was part victory parade and part warning demonstration against the futility of continuing hostilities. 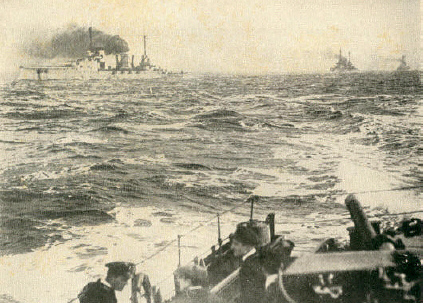 It was concluded with the German fleet being entirely surrounded. Not simply grandiose, the manoeuvre was designed to overawe the German seamen, for Smith makes it plain, "The fleet was never in more readiness for action, for we never trusted them at any time." So at dusk as the sky reddened over the Scottish hills, the buglers of the British fleet sounded the call 'Sunset', the ensigns of the Imperial German Navy fluttered slowly down for the last time. And darkness closed like a curtain on the final act of this mighty drama at sea. A trip to Scapa Flow would be a most interesting dive to see the scuttled German fleet, of course it would mean we would need to sharpen our scuba and snorkeling skills. HUGH RODMAN Is he related in any way to Hilary Clinton????????????? That's Dennis Rodman, the Basketball Star/North Korean Goodwill Emissary...sorry I couldn't resist that. Actually in Hillary's case it is Rodam. I would love to see Scapa Flow! Hey maybe Mike could put together a tour, figuring some other spots in the north to visit as well. I hear Kirkwood, which is just over the hill from Scapa Flow is a most interesting town, and during the War in fact a Prize Court convened there. How the War Was Lost: The Food Weapon? Aviation Industry Advertising Takes Off! What? Nurses and Soldiers Flirting on the Wards!